One of the biggest challenges being experienced is the need to continue to provide new titles in both formats: paper and eBook. Students and staff have not yet fully accepted that a title may only be available in one format or the other, meaning that new titles are effectively being purchased twice. Cathy’s end goal is very clear however: for borrowers to be comfortable reading a title in either format, meaning she only needs to purchase it in one format or the other. She also cleared up another misconception held by many students and teachers: eBooks are not cheaper than traditional texts when being purchased in a library setting. Many students are used to seeing books online for $4-$5 and think that the titles in the library cost the same amount. A metered eBook that can be loaned another 25 times before it expires. 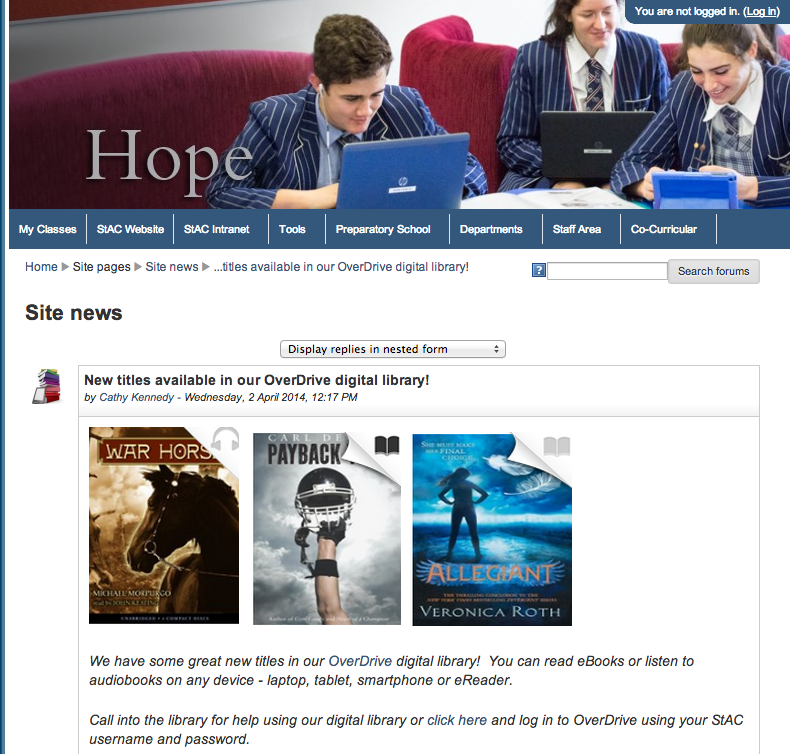 When purchasing new titles for the collection, Cathy primarily had the Year 9 students in mind since she knew they would all have their own device with which they could borrow titles with. 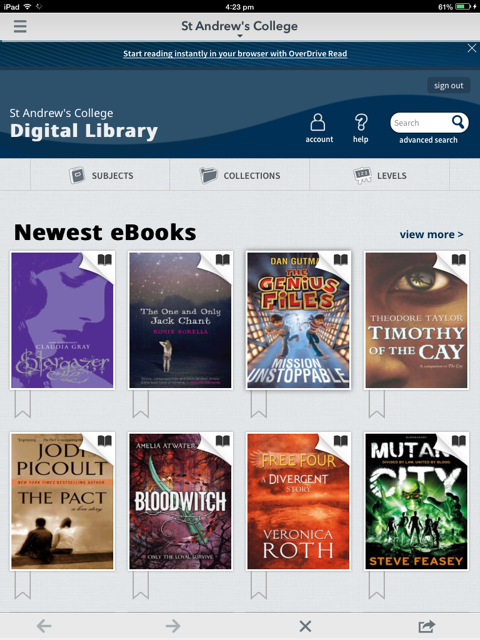 Most of the new titles being added to the OverDrive collection are fiction, as the library already caters for non-fiction titles through the printed books already owned, along with subscriptions to World Book Online and other database services such as EPIC. There is definitely some resistance among students to reading online however, I feel this will change and I wanted to be ready! The very keen and established teen readers, tend to still like to read a paper book but one group who seem to like the idea of eBooks are the challenged readers or reluctant readers. One thing that eReading does is level the playing field – no one can see the ‘size’ of the book you are reading so some of the learning support students really took to an eBook with enthusiasm! The use of “shelf talkers” – labels on the shelves in the library that indicate eBook availability to students. There has been a significant investment into getting the eBook platform implemented and populating the titles in the current collection – it now exceeds over 500 eBooks. The pricing model means that this will be added to continually each year and Cathy is also exploring the possibility of the Wheelers eBook Solution as they typically contain more New Zealand authors in their collections than OverDrive. I am hopeful that the combined printed and electronic formats of books means our students will continue to be inquisitive readers during their time at St Andrew’s College. This entry was posted in eLearning, English, Library, Preparatory School and tagged Curriculum, eBooks, Education, English, Information and communication technologies in education, Library, Literacy, Preparatory School, Reading, St Andrew's College, Student engagement, Technology by Sam McNeill. Bookmark the permalink.